Eyelash extensions and permanent make-up are types of beauty services in demand. These semi-permanent services save time and awkward mis-shape. It helps cut down time to get ready in the morning and have you always looking perfect no matter where you are and at any time of the day. You no longer need to worry about mascara smudges or how to achieve that perfect eyeliner wing. The perfect you is just a full set or a consultation away. We offer a variety of products and services to suit the needs of our clients; eyelash extensions, lash lifts, permanent makeup, waxing services and lash extensions training. We strive to be the best eyelash extensions studio, permanent makeup (PMU) artist and training academy in the Ottawa area. We are constantly educating and training our staff. Our trainers have travelled around the world to learn from various international lashes and PMU masters. Keeping up with the newest lash or PMU trends and knowledge is no easy task. Our trainers are equipped with extensive training from Xtreme Lashes, Hanna Putjato CEO of London Lash Pro, Sugarlash Pro Canada, Hoa CEO of Hoa Lashes, Academy S by Sviatoslav Otchenash, Trang CEO of Queen Brows and many more. We are located by the outskirts of downtown Ottawa, on Preston street within Little Italy. We are open 7 days a week, providing you with more options when booking your appointments. Eyelash extensions are synthetic or animal hair that mimics real human eyelashes. They are applied with medical grade glue and enhances the fullness of lashes, curls, thickness, and lengths of natural eyelashes. There are a variety of quality to choose from; synthetic mink, real mink, cashmere and silk, Real mink is from animal hair, not a lot of lash boutique carry this because of its price, animal cruelty, allergies, and maintenance. Lash extensions itself comes in different thickness, curls, and lengths. This way, lash technicians can customize a set that is suitable for their customer’s eye shape. To apply the lash extension, the ends of the lash extensions are dipped in glue and then applied to one natural lash at a time. The process for a new set of eyelash extensions takes between 2-3 hours, for a refill the service takes between 1-1.5 hours. How long the service takes, depends on the lash technician’s experience. When lash extensions are done properly, it can last up a few months; depending on one’s natural hair growth cycle and how it is maintained. With proper aftercare, the lash extensions will last longer and are more beneficial for your natural lashes. When new to the location, arrive at your appointment 10-15mins earlier to fill out any eyelash extensions consent forms. After filling out the forms, the lash technician will go through your forms to see whether you are fit for the service. If you are fit for the service, you will have a consultation to see what you are looking for from your services. Your lash technician will help you choose style, lengths, and density for your eye types. Your eyes will be prep for the application; cleaning and then application of gel pads to separate bottom lashes from top lashes. Your eyes are required to be closed throughout the whole process until the application is done. Classic eyelash extensions are done by picking one lash extension, dipped in glue, and applied to one natural lash. This is done until all the mature and healthy natural lashes are applied too. If lashes are too short or thin, they will be exempt. Volume eyelash extensions; lashes are hand fanned, dipped in glue, and is then applied to one isolated lash. How long does an eyelash extensions appointment take? A new set of eyelash extensions takes around 2 to 2.5 hours, depending on the set and the speed of the technician. Refills take around 60 mins to 75 minutes. The lifetime for eyelash extensions vary. It depends on the natural lash cycle, product quality and how lash extensions are maintained at home. The lash cycle can be between 2-6 months. On average humans shed up to 20% of their natural lashes every 2 weeks. Why is home maintenance so important with lash extensions? Cleaning your lash extension regularly with a lash friendly cleanser is a must. Lash extensions are very different from natural lashes because the glue base of the extensions can easily trap dirt, dust, products, and oil. Being dirty for a long period of time can clog hair follicles and also become a breeding ground for mites, lice (yes, they can run around your lashes) or bacteria which causes blepharitis, stye etc… As a result, it leads to long-term hair loss. This is a reason why coming in for a lash appointment we recommend coming in with clean lashes. Cleaning make-up or other products off will not only take up precious appointment time but product residue can coat between lashes and glue causing the lash extensions to slide off faster. If you constantly wear mascara and eyeliner this is one of the main culprits for lashes not lasting as long. Visit our “Aftercare” to learn how to properly maintain your lashes. Why are the white part of my eyes red after lash services? There are a few possibilities: chemical burns, eye patch/ tape scratches, eye sensitivities, fatigue, and sleeping. Chemical burns are from the fumes of the glue entering the eyes. Glue fumes can enter the eyes if your eyes are not closed properly, either biological build or from eyes twitching (caffeine, tiredness, anxiety, and muscle movement). No, if the lashes are applied properly, it will not damage your natural lashes. By following the recommended aftercare, lash lengths and density, you can wear lashes for a very long time. Yes, if lashes are applied improperly, it can cause damage to the natural lashes. By applying an excessive amount of glue or lashes, may put too much weight on natural lashes. As a result, this can cause the lashes to fall off prematurely. Improper at-home care is also a big contributor to damaging natural lashes. Visit our “Aftercare” to prevent future damages to your lashes. Are eyelash extension glues formaldehyde-free and latex-free? Yes, our glue ingredients are formaldehyde free and latex free. Although it is formaldehyde free, all glue contains a glue curer (a component which helps glue dry), which can form formaldehyde as a byproduct during the curing process with exposure to air. 8 things to know about eyelash extensions allergies. 1. What causes an allergic reaction to eyelash extensions? There are a few things that could cause an allergic reaction; lash extensions glue, eye pads and tape. Eyelash extensions glue is the main product that would cause an allergic reaction. Cyanoacrylate and carbon are the two main ingredients in the glue that a lot of people are sensitive to. Cyanoacrylate is in all eyelash extension glue, it is the fast-drying agent that makes glue dry quickly. Carbon is the ingredient that gives the glue its black colour. 2. Can eyelash extensions allergy happen to anyone? Yes, when using any chemical or substances, anyone can become allergic at any time. It can happen to customers who are new to the industry or customers who have been wearing eyelash extensions for years. Our body is always changing, unfortunately we can develop an eyelash extension glue allergy over time. 3. Is it a glue allergy reaction or irritation? During the eyelash extensions application, if the eyelid is not closed properly, the fumes from the glue may seep into the eyes causing a chemical burn leading to irritations. When this happens the bottom sclera (bottom white part of the eye) becomes red and irritated. Some customers naturally think puffy, itchy or watery eyes are from an allergy reaction, but seasonal allergies can contribute to making the eyes sensitive. With seasonal allergies, it causes the eyes to be extra irritated to any chemical or products applied near the eyes. For a customer with strong seasonal allergies, we don’t recommend long-term wear of lash extensions. Rubbing itchy eyes while wearing lash extensions can lead to natural hair loss. Gel pads can cause an allergic reaction, but most customers eyes are just sensitive to the gel ingredients. When gel pads shift inward or are put too close to the inside of the eyelid, the gel from the pad expands with the moisture in our eyes, causing a chemical burn or irritation from friction. When this happens, the bottom sclera becomes red and irritated. To ease with the irritation, use mild eye drops. Most irritation should subdue after a couple of days. If symptoms persist more than a few days, contact the lash technician and doctor for advice. 4. What are symptoms of an allergic reaction eyelash extensions? Some customers with severe glue allergies, their eyes itch instantly, and then it irritates and the eyelid becomes red and swollen. Some customers with a less severe reaction to eyelash glue show symptoms after 12-24 hours. There are customers that have a very mild allergic reaction to lash glue, they will only have symptoms while the glue is drying. After the glue dries completely, the allergy symptoms go away. If in doubt, we recommend applying a glue test. 5. What to do when you’re allergic to eyelash glue? When there are symptoms of eyelash glue allergies, it is best to contact both the lash technicians and a doctor for medical advice. Lash technicians can’t provide medical advice but can help remove the lash extensions to reduce further allergic reactions. 6. How to prevent an allergic reaction to eyelash extensions glue? It is best to get an allergy test 24-48 hours before getting a new set of eyelash extensions. Ensures that the eye pads are applied properly. Always come to your lashes appointment with clean eyes to prevent any cross contaminations. 7. Any glue for sensitive eyes? Yes, there are eyelash extension glue in the market that are made for sensitive eyes. However, these glue don’t hold the extensions for as long as the standard ones. Most lash extensions will shed a lot faster than regular glue. 8. How is the eyelash extension allergy test done? There are two types of allergy tests, one is done 24-48 hours before the actual lash appointment, the other is done 15 mins before the lash service. Getting an allergy test 24-48 hours before the service is the most accurate way of finding out whether you have an allergy or not. This test takes around 15 mins. Either to one eye or on both eyes, 5-10 short eyelash extensions are applied. After the test, keep an eye out for any reaction at home. Allergy test that are done 15mins before the service will only show the result of severe allergies and sensitivities. The products are applied behind the ears or on arms and left for 15 mins. What you need to know before your eyelash extensions appointment. Before your appointment, wash your lash area for a clean working canvas. Don’t consume too much caffeine, it may cause some eyes to twitch. Wear removable footwear, before laying on the bed; footwear must be removed. If you are new to this location, arrive 10 minutes earlier to fill out the consent forms. Most lash appointments are booked and charged by time booked, being late will cut your appointment time short. Lash Refills are recommended normally every 2-3 weeks for classic and 3-4 weeks for volume lashes. To qualify for a refill, your lash extensions should still have a 40-50% remaining. At your refill appointment, if your lash extensions are less than 40% left, your lash technician will only be able to fill what is possible in the given appointment time. To maintain the same fullness as a new set, come in for your fill more frequently. During the process, only very grown out lash extensions will be removed, new lashes will be put in. There are a few eyelash extension styles, cat-eyes, doll-eyes, natural eyes, and messy eyes. Cat eyes: Lashes are longest at the outer corner of the eyes. It gets gradually or dramatically shorter at the inner corner of the eyes. Doll eyes: Lashes are longest at the middle of the eyes. it gets shorter on both corners of the eyes. Natural eye: Lashes are longest around the eyebrow arch area. The inner corner of the eyes are where lashes are the shortest and outer corner are where its mid-length. Messy eyes/ Kim-K: This look is where short lashes and long lashes are randomly placed for that messy look. How to remove eyelash extensions? Removing eyelash extensions at home is not recommended. It best to go to a professional for any removals. Applying a lot of oil to lash extensions will only loosen the glue bond but is not enough to separate the lash extensions from the natural hair completely. Pulling and rubbing at the lash extensions will cause loss of your natural lash. For eyelash extensions to be removed, a gel or cream solution is applied to the lash glue. The product will break the glue bond, helping the lash extensions to just slip off from the natural lashes. Become a Lash Technician!! It’s one the fastest growing industries. Why choose us as your trainer? 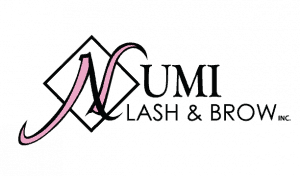 At Numi Lash & Brow, our focus is not on the brand, but to teach you how to safely and correctly apply eyelash extensions. We provide long-term practical guidance and support. Our trainers will work with you at your pace, whether it is slower or faster. After completing your training, we ensure that you can work on customers without feeling lost and confused. We will provide a starter kit that comes with the basic supplies of everything you would need to start out. You will be working on a mannequin and live model for hands-on experience. It was my first time getting my lashes done and the staff were super helpful and friendly. Store was also very clean and the service was great. I'll definitely be coming back. This is the second time I've gotten eyelash extensions but my first time at Numi Lash & Brow. Vicky was right on schedule which I appreciated and friendly. She asked me the type of style and lash length I was looking for. She took a look at the condition of my eyelashes and the length of them and based on this she recommended what would be best for my eyelashes, I really liked this and it was very professional (and a first to hear)! Overall, I am very happy with my eyelashes and would definitely go back/ recommend them!! I have experienced my share of technicians. Vicky is EXCELLENT at what she does. She has won me over as a permanent client. Beautiful work. Numi is easy to book with and has great availability. Wonderful service, thank you! It was my first time getting extensions and Vicky was extremely helpful. The results exceeded my expectations and she made the process extremely enjoyable. Over all great experience!! Being from out of town I was worried to try a new place as lash extensions can be pretty hit or miss. I was extremely happy with my experience at Numi Lash and came out with gorgeous looking lashes! The process was long but comfortable and the technician was very friendly! Unlike other places my eyes didn't water after the lashes had been applied as the process was done very carefully. Quite pricey but you get high quality for it! Loving my lashes so far!